UPDATE: These chairs are all sold! I can't believe it! There were 40 for sale and they are all gone! So sad for me. So I recently found these chairs on KSL Classifieds, and I'm thinking that with a paint job they could be cool with my future Big Sur Dining Table. 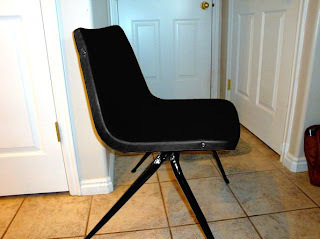 I can't afford the table right now, so my temporary solution would be to put a cool tablecloth on my current table, and use these chairs with it. I'm not sure yet what color I would paint them, but below you can see what I've been toying with. 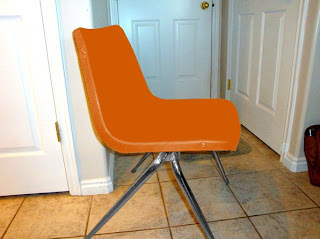 Original (kind of a pukey yellow matte finish): Black glossy paint on seat and legs (my counters are black granite so they would go nicely): Black seat with chrome legs: Orange seat for a pop of color (is it too much? ): I think I'm liking the full black one. White is also under consideration. But I'd love to hear what you think.